Jette Vandermeiden weaves all types of cloth on looms with four and more shafts, including compu-dobby looms, but her love is Damask and Scandinavian weaves woven on her drawlooms. She offers classes in weave structure and theory and teaches extensively, presenting seminars and workshops at colleges, conferences and guilds, locally and internationally. 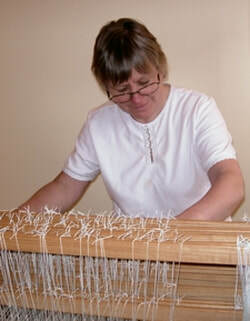 Jette has served as Weaving Education Chair for the Ontario Handweavers and Spinners and as a columnist for Fibre Focus. Her goal is to share weaving skills so this ancient craft will continue to enrich our lives. Just in time to celebrate a return to Spring, learn how to create woven lace in an extensive two day workshop! Participants will bring a dressed, 4 shaft looms for Round Robin weaving in this extensive workshop. A complete list of the warping instructions and materials list will be emailed to participants by March 1, 2018. Discussions of different threading units and weave structures for laces will be addressed. Plenty of group discussion, hands-on weaving and sharing will be included in this workshop.